test Lphant - Stay Away From This "Mystery Software"
Update: As it seems, this new version of Lphant is the same as Bearshare and iMesh. Still, we absolutely don’t like the massive lack of information on the official website. Better choose a different program for file sharing or directly opt for the official iMesh client if you want to go for the music subscription service. 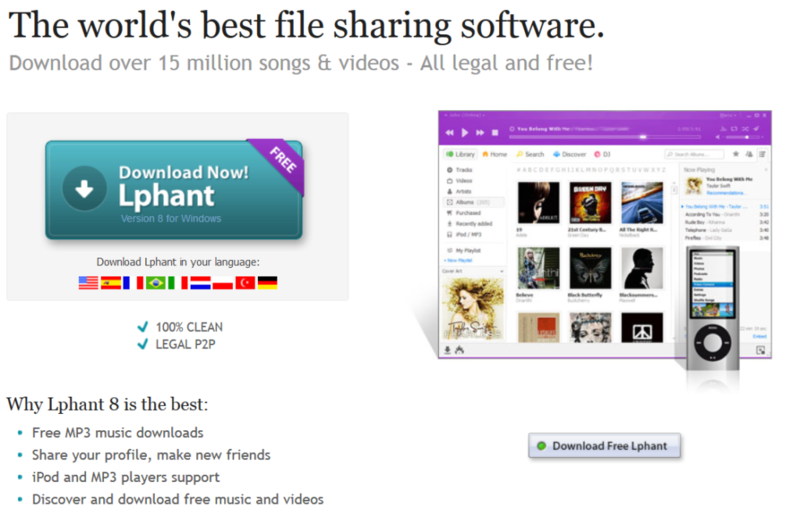 Along with eMule, aMule and Shareaza, Lphant was a file sharing client based on both ed2k / eDonkey and BitTorrent. It had a rather small userbase, and completely free, with no expensive “pro”-versions available. Speed, features and comfort were comparable to other clients for the same network, and Lphant lacked originality, so it never got over the state of being “yet another” eMule clone. In 2009 however, both the website and advertising servers of the software were bought by Discordia Ltd., which also got hold of iMesh and Bearshare, and completely remodeled the whole thing. Apart from the logo, it is now an intransparent mixture, made of a YouTube search engine, some undisclosed P2P network (the same as iMesh uses? ), and a simple BitTorrent client. We’re not sure about what to make of it. Apart from having nothing to do with the former program, a number of claims such as “15 million songs & videos” and, of course, “legal P2P”, greatly annoy us. First of all, there is no information about how exactly this “legal and free” music and video is licensed. Does the software display advertising, or install spyware to make money, which is then used to pay for the licenses? Is there a special deal in place with the RIAA? And which P2P network is used? Can you really download any file without having to be afraid of lawsuits? Again, what is this miraculous source of free content that you don’t have to pay for and is fully legal at the same time? This “mystery approach” is absolutely not anything we want to have on our computer. After a brief look, we deinstalled the same thing and hope nothing of it remains on our system. Sure, it has a few nice features, but any software that doesn’t tell us anything about what it exactly does, and with dubious legal status, is a no-go for us. Stay far from it and if you want to download torrents, get one of the many, safe clients such as uTorrent.